Back in 1982, Cialdini wrote, "Something special happens when people personally put their commitments on paper: they live up to what they have written down." That's why change guru Tony Robbins recommends that people commit their goals to paper. And that is why it would be worth your time to write down your resolutions for change, and to sign the page. Signing a legal document with a fountain pen. With the start of 2016, you've resolved that this is your year for change. Now, how to make that commitment stick? You've probably got a few tricks up your sleeve. I doubt any of those strategies will have you writing your plan down by hand and then signing it. Here's why you should consider doing exactly that, along with whatever other efforts will help you reach your goal. Many years ago, back in the era of the door-to-door salesman, the U.S. government implemented "cooling off" laws. Consumers who fell prey to high-pressure sales techniques could now reverse the purchase they had made. And they did so in droves. It was a devastating blow to companies that relied on manipulating others. Psychologist Robert Cialdini reported that those companies found a very effective method to counteract the effect of this law. It was simple. Instead of having the sales professional fill out the sales agreement, they had the customer themselves write out the paperwork. In their own handwriting. Seeing a document that they themselves had written, recognizing their own hand, their own signature, a full expression of agreement, pressured customers to keep to their word. The number of returns diminished. Back in 1982, Cialdini wrote, "Something special happens when people personally put their commitments on paper: they live up to what they have written down." And, of course, we know that a signature makes an agreement legally binding. That's why change guru Tony Robbins recommends that people commit their goals to paper. And that is why it would be worth your time to write down your resolutions for change, and to sign the page. Maybe this leaves you wondering whether young people have the same sense of commitment to anything they sign. 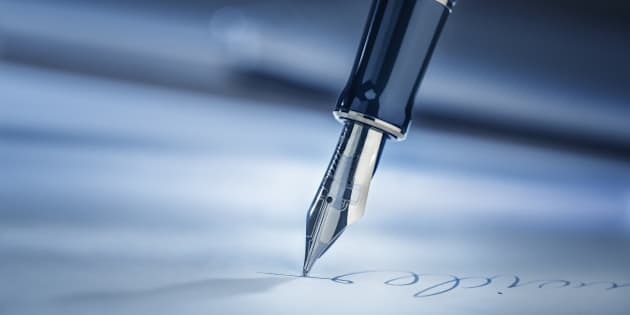 People who do not have a practiced handwriting might not feel so connected to their John Henry, nor inclined to feel bound by the simple act of signing a document. The fact that many young people do not have a practiced handwriting nor a fluid signature actually has me concerned. Concerned enough to work with a graphic designer to put together a 20 panel display designed to excite and motivate young people to cultivate a truly expressive signature that they can feel good about. In the display, I feature signatures of public figures who, interestingly, inadvertently embed fascinating images of their interests or talents right there in the signatures. I want young people to realize that the signature is a medium for self-expression. Seeing how former prima ballerina Karen Kain seemingly embeds two dancers in her signature, arm in arm, as if ready to take a bow or how astronaut Neil Armstrong seemingly depicts a rocket and a launch pad in his can help young people realize just how much can be expressed in signatures. Do you see a violin and a bow in the signature of violinist Isaac Stern? When we strongly identify with the talents we have cultivated, don't be surprised to see those interests finding their way into our signatures or into the handwriting more generally. Those mindful of money or math will often write letters that look like numbers. Musicians or those musically inclined will often write letter formations that look like musical notes. But only practiced writing will show these features. My display, demonstrating paper as a sort of canvas for self-creation, promotes handwriting not by citing studies that show that handwriting notes in class improves comprehension and higher order thinking (which it does); the display paints handwriting in a light that we rarely consider. The young, those just striking out to establish identities based on interests and talents, have so far seemed quite keen to explore the written word from this vantage point. This exhibit is being shown at various libraries around Toronto, and is available at no cost for display in schools, community centers, or other venues for whom literacy, in all its guises, is a priority. In order to benefit from writing out your New Year's resolutions, you have to be able to write! Let 2016 be the year that cursive handwriting finds its way back into the school curriculum and pen and paper rightly reclaim a greater role in daily family life. This column introduces the clinical application of the psychology of handwriting, a European technique mostly unfamiliar in North America. Readers can bear in mind that graphology is appropriately used alongside other assessment methods, never used in isolation. This use is discussed fully in Clinical Graphology: An Interpretive Manual for Mental Health Practitioners, published by Charles C. Thomas Publishers. What&#039;s in a Celebrity&#039;s Signature?